(Bloomberg Opinion) -- The challenge for BT Group Plc. has long been twofold: the high costs of its large workforce, and the low prices in the British market. New Chief Executive Officer Philip Jansen would have been well aware of the issues when he took the reins in February. He would also have seen how contentious disputes over pricing and other issues with the nation’s regulator, Ofcom, contributed to his predecessor’s demise. Unfortunately for BT employees, Gavin Patterson’s inability to secure higher wholesale prices leaves Jansen with little option but to shed staff to turn things around at the former British national carrier, whose stock has lost half of its value over the past three years. It doesn’t help that the chairman insists on preserving the dividend. It’s tough for BT employees. But the regulator’s intransigence has backed the CEO into a corner. The measure could deliver extra annual savings of as much as 900 million pounds ($1.2 billion), according to Bloomberg Intelligence analyst Matthew Bloxham. In combination with a plan introduced last year to fire 7,000 people, that could yield a 10 percent boost to earnings before interest, taxes, depreciation and amortization, he said. It’s money that BT may need. All but 200 million pounds of the firm’s normalized free cash flow of 2.5 billion pounds is committed to fund the dividend, pension deficit, spectrum costs, restructuring costs and share buybacks to cover employee stock options, according to Berenberg Bank analyst Carl Murdock-Smith. That leaves little flexibility to invest in growth drivers such as the network, or cope with the unexpected. 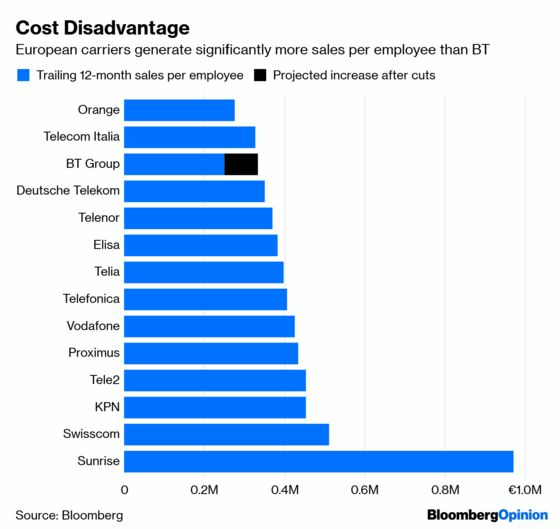 The headcount reduction would bring BT’s revenue per employee far closer to the levels of peers such as Deutsche Telekom AG. 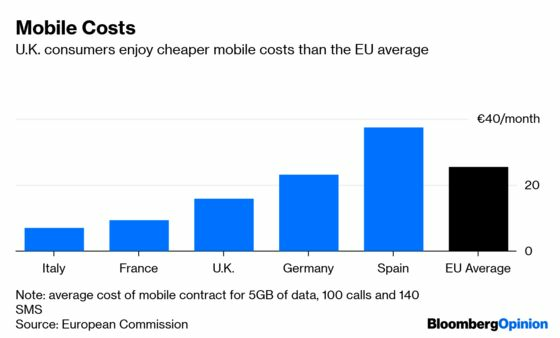 That would be particularly remarkable given that the German legacy carrier enjoys a far more generous pricing environment in its home market, where cellphone contracts can be twice as expensive as in the U.K. If Jansen is able to push the cuts through, investors may view the shares more positively. Chairman Jan du Plessis promised in May to maintain the dividend for two years, which costs about 1.5 billion pounds annually. That may be a hard pill for employees and politicians to swallow if layoffs of this scale are indeed implemented. Shareholders shouldn’t be surprised if a cut to the dividend ultimately ensues in order to distribute some of the pain.